Click here to see photos of our County Senior Football Championship match against Clashmore played at Fraher Field. Once again, many thanks to Seán Byrne for providing us with these great action shots. Our popular Jack the Joker Fundraiser will continue this Sunday night in Kennedy’s Live where the Jackpot will be €6,560 as on Sunday night Kevin and Nora Tobin were drawn out of the drum and picked card 21 which wasn’t the Joker though they did win €50. Jim Egan and JJ Whelan won €25 each. As well as our group of ticket sellers tickets can be purchased from Convenience Store Ballinroad, The Village Inn, Village Flowers, Kennedys Live, Spar, Mike Kiely’s Butchers and Mousies Takeaway. On Sunday evening last we defeated Ring in Round 3 of the County Championship in Fraher Field. TEAM: S. ENRIGHT, D. COLLINS, B. LOOBY, G. BREEN, S. O’DONOVAN, S. O’HARE, C. MOLONEY, J. HURNEY, J. O’MAHONY, P. HURNEY, M. FERNCOMBE, M. O’HALLORAN, M. GORMAN, G. HURNEY, J. O’BRIEN. SUBS: J. POWER, R. SHEEHAN. On Thursday night we play Clashmore in the County Championship at 8:00pm in Fraher Field. After months of very careful planning and indeed hard training by many of the participants our Sponsored Cycle from Limerick to Abbeyside goes ahead this Saturday. When Liam O’Connor first mentioned the idea of the sponsored cycle last year few could have envisaged that it would be as successful as it now looks like being, which is thanks to the hard work of the small group of people who worked so hard behind the scenes. On Saturday morning 30 cyclists will depart Limerick city at 8.30am for the 130kms to Abbeyside. While many of the group are experienced cyclists, a good few are new to the sport. Many hours of training has gone into prepare for the cycle. For the people that are joining the group on the route please be in Glenshenane Woods car park at 2pm. Family cycle will leave Quills The Pike at 2.45pm. We would like to invite all club members to get out the bikes and join in the cycle. Children must be accompanied by an adult and helmets must be worn by all participants. Finally we would also like to say a big thank you to all our sponsors, and we look forward to seeing a big turnout on Saturday to cheer home the cyclists in Abbeyside at 3pm. To round off what should be a great day for the club on Saturday we are holding a Summer Barbecue in Kennedys Live at 8pm. Music on the night is by the Waxies and we will be holding a raffle on the night for some very attractive prizes. 1st Prize - 2 nights B&B in the Clarion Hotel Limerick. 2nd Prize - Newbridge Cutlery set. 3rd Prize - €100 Holiday voucher. 4th Prize - €100 Easons voucher. Plus many more prizes. Tickets for barbecue and 5 tickets for raffle cost only €5. Please come along and show your support for the club at what promises to be a great night’s entertainment. This Sunday our Club Bingo returns to the CBS Hall at 8:30 pm where the jackpot is €1050. On behalf of all in the club we would like to congratulate the County Minor Hurlers on their great victory over Dublin on Sunday last in Thurles. Conor Prunty was on the team while Stephen Cliffe and Sean Daly were on the panel and Donnacha Enright and Pat Moore are part of the backroom team. Anybody looking to order tickets for the All Ireland Minor Semi Final against Kilkenny is asked to do so by this Friday by contacting Jonathan O’Donovan. Last Monday our under 14’s travelled to Waterford to play Mt Sion in the hurling championship. Our boys started this game very well, with some well taken goals early on, and maintained this momentum throughout the game to record a win 8-12 to 1-4 being the final score. Next match in this age group is at home to Clonea on Monday 11th August and away to Ballygunner on the 18th. Panel: Jake O’Riordan, Eoin Ahearne, Danial Raher, Sean Kent, Meldan O’Dwyer, Eoin Flynn, Shane Kiely, Dathi Brunnock, Jamie Walsh, Ben Flynn, Senan Travers, Cian O’Riordan, Michael Kiely, Patrick Fitzgerald, Oisin Hallahan, Danny Reynolds, James Riordan. Our under 13’s played Dungarvan on Monday evening just gone in the final round of the Under 13 hurling. Result next week. Our minor hurlers were down to play the next round of their county championship last night Tuesday away to Ferrybank. At the time of going to print the result of this match was unavailable but will be included in next week’s notes. Our under 16 hurlers play the next round of their county championship away to Roanmore tomorrow night Thursday. Best of luck to all. Our under 11 hurlers travelled to Fraher Field on Saturday morning last to take part in a Gala day. We played two games on the day against Cappoquin and against Youghal and played well in both. We won both games and tremendous credit must go to all the player’s involved. The next event for this group of players in the town and country football league which takes place soon. Our underage outdoor hurling continues this Saturday morning the 2nd August at the Burgery at 10.30am. All are welcome. This covers all age ranges from under 5 to under 10. Anyone who has not paid their membership yet is asked to pay it on the morning for insurance reasons. Membership forms will also be given out on the morning. Helmets are compulsory and if required can be purchased at a reduced price of €50. There will be a €2 cost also to cover expenses. The club's sponsored cycle from Limerick to Abbeyside takes place this Saturday, 2nd August. The cyclists will leave Limerick at 8:30am and hope to be back in the village at about 3:00pm. That evening a BBQ will take place in Kennedy's Live at 8:00pm. Music will be provided by the Waxies. The cost is just €5 and will include raffle tickets for some fantastic prizes. Everyone is welcome to attend. All in the club wish the cyclists a safe and enjoyable trip and thank them for their efforts to raise funds for the club. Back Row (L to R): Mark Fives, Stephen Lanigan, Shane Briggs, Jonathan Moore, Patrick Hurney, Eoin Brackett, Seán O'Hare, Gavin Breen, Gary Hurney, James Hayes, Simon Hanrahan, John Gorman, Patrick Lynch, Pa Enright, John Kindregan, Laurence Hurney. 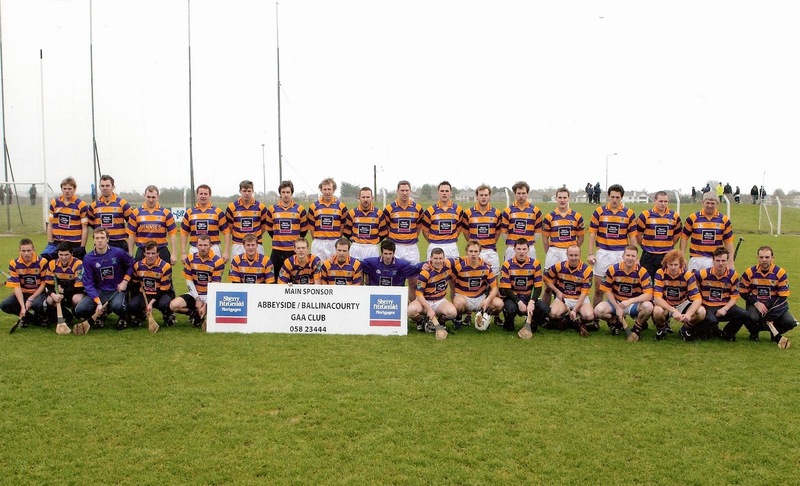 Front Row (L to R): Shane O'Donovan, Brian Scanlon, Stephen Enright, Brendan Walsh, John Phelan, Stephen Slater, Eoin Enright, John Foley, Daryl Ryan, Tiernan Murray, Richie Foley, James O'Mahony, Michael Enright, John Hurney, Declan Fives, Mark Ferncombe, Mark Gorman. This week's photo comes from the 2008 County Senior Hurling Final played at Fraher Field in dreadful conditions on 9th November. In the group stages, Abbeyside defeated Mount Sion and Passage before losing to Lismore. In the quarter final, the boys beat Ballyduff Lower and followed this with a replayed victory over Ballyduff Upper. Abbeyside's first County Senior Hurling Final appearance in 39 years ended in an agonising two point defeat to De La Salle, 0-11 to 0-9. Our popular Jack the Joker Fundraiser will continue this Sunday night in Kennedy’s Live where the Jackpot will be €6,360 as on Sunday night Nuala Kenneally was drawn out of the drum and picked card 7 which wasn’t the Joker though she did win €50. Anna Fahey and Joe Mulcahy won €25 each. As well as our group of ticket sellers tickets can be purchased from Convenience Store Ballinroad, The Village Inn, Village Flowers, Kennedys Live, Spar, Mike Kiely’s Butchers and Mousies Takeaway. On Sunday evening last we were defeated by Nire in the semi final of the Phelan Cup in Fraher Field. TEAM: R. RYAN, B. LOOBY, C. MOLONEY, D. HENLEY, D. COLLINS, J. HURNEY, S. O’DONOVAN, S. O’HARE, G. HURNEY, P. HURNEY, M. FERNCOMBE, D. LOOBY, M. GORMAN, J. O’BRIEN, J. POWER. SUBS: R. SHEEHAN, N. DEE, P. LYNCH, J. ELSTEAD, E. COLLINS. On Sunday night we play Ring in the County Championship at 7pm in Fraher Field. This Sunday our Club Bingo returns to the CBS Hall hall at 8:30 pm where the jackpot is €1000. On behalf of all in the club we would like to welcome Fr. Colin Fives home from his work in Nigeria. Fr.Colin is currently home on his annual break from the missions in Nigeria and we hope that he enjoys his time back in Abbeyside and gets to see plenty of matches during his well-earned break. Our underage outdoor hurling continues this Saturday morning the 26th July at the Burgery at 10.30 am. All are welcome. This covers all age ranges from under 5 to under 10. Anyone who has not paid their membership yet is asked to pay it on the morning for insurance reasons. Membership forms will also be given out on the morning. Helmets are compulsory and if required can be purchased at a reduced price of €50. There will be a €2 cost also to cover expenses. Bingo takes place every Sunday night in the CBS Hall, Dungarvan starting at 8:30pm. The total prize pot each week is €1100 along with a rising jackpot based on a certain number of calls. Single books and quickies cost €10 and double books and quickies cost €12. Regular players and visitors are most welcome to come along. All funds raised go to costs associated with the running of the club. Back Row (L to R): Nick Thompson, Willie Fennell, Shane Briggs, Derek Hayes, Jim White, James Hayes, Gary Hurney, Laurence Hurney. Front Row (L to R): Karl Power, Benny Cliffe, Conor Barrett, John Foley, John Organ, Séamus Sheehan, John Phelan. This week's photo features the Ballinacourty U21 Football team that won the County 'A' Title in 1998 with victory over Gaultier at Walsh Park. This county win, the first at the grade since 1979, began a very successful period for football teams in the club.